Rehydrate the sea cucumbers by placing a pot of water on the stove and heating it to a boil. Put the sea cucumbers in the pot, and simmer on medium-low heat for about 20 mins. Turn the heat off after 20 mins and cover the pot. Soak the sea cucumbers for up to 12 hours or overnight in the pot, allowing the liquid to cool down to room temperature. After 12 hours, drain and place the sea cucumbers in a bowl and replace with fresh water. Keep soaking the sea cucumbers in the refrigerator for 1-2 days. Check on the consistency by squeezing the center of the sea cucumber. They will be ready to use when the center is the consistency of soft rubber and the surface is slippery and slimy. When ready to use, drain and cut a slit from end to end on the underside of each sea cucumber. Remove the intestines and rinse with cold water to clean the insides completely. Slice into ½ inch pieces on the bias and set aside. Marinate the pork in a small bowl with cornstarch and soy sauce and set aside. Heat a wok at med-high heat and swirl in the vegetable oil. Add the garlic and ginger slices and stir-fry for about thirty seconds. Add the pork to the wok and stir fry for about 1 minute. 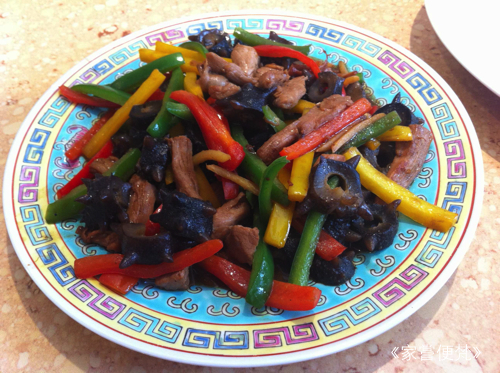 Add all the pepper slices and sea cucumbers to the wok and stir-fry for about another minute. Add the sauce ingredients: shaoxing rice wine, oysters sauce, soy sauce, and sugar, and stir-fry for another 30 seconds or until the sea cucumbers are heated through and the pork is cooked. Add the cornstarch slurry and stir fry until the sauce thickens. Plate the dish onto a family size platter, serve hot, and enjoy!